A wall of translucent glass. Of course, no tongues of fire. Her wingbeat warm against his cheek. 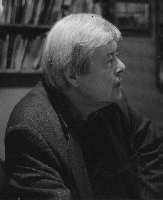 Following his editorship of the poetry magazine Phoenix (1958 - 1975), Harry Chambers founded Peterloo Poets in Manchester in 1972. Peterloo’s first two full collections published in 1976 were Elma Mitchell’s The Poor Man in the Flesh and Edmond Leo Wright’s The Horwich Hennets. Peterloo Poets went on to publish 240 volumes of poetry. Many Peterloo titles are available direct from our authors.